If you want to work from home but are having a hard time actually finding a remote job, don’t worry. You’re not alone. You search daily for job leads. Applications get regularly put in. But every sent resume and submitted application goes nowhere. Some 7 years ago when I started my remote job search, I was in the same boat. After hundreds of submitted applications and exactly zero call backs, I put on the brakes. It was time to reevaluate my job search strategy. Clearly, what I was doing just wasn’t working. As it turns out, the world of remote work is a lot different than the traditional job search landscape. Here’s what I learned (and did) to land five great remote jobs in five short years. My initial strategy was to find any ol’ remote job. Honestly, it didn’t matter what it was as long as it gave me the option to work from home. I figured, the more jobs I applied to the greater my chances of getting hired, right? I had the job search and application submission process down to a science. I could find a job lead via Indeed and apply to it within 5 minutes flat. My strategy was to use a cookie-cutter style resume that I mass sent/submitted to every single job. But this so-called strategy is flawed. You see, a single remote job ad gets hundreds of job applicants. Overwhelmed recruiters and hiring managers use smart software called Applicant Tracking System (ATS) to help them filter the good potential hires from the bad. To do this, the recruiter tells the ATS to search submitted applications and resumes for a specific set of keywords. These keywords are related to the position they’re trying to fill and often can be found directly in the job ad itself. Remember, an open job ad is essentially an employer’s description of their ideal hire. The skills, qualifications, and traits listed in the ad are exactly what they’re looking for in an employee. So, in order to get yourself in front of a real person, you need to first get past ATS. And the best way to do this is to keyword optimize your resume for every single job you apply to. Yes, this is more labor intensive. I know. But, when you take the time to customize your resume for a particular position, you increase your chances of actually getting an interview, which could lead to a job offer. Now, because you’re taking more time when submitting an application, the apply-to-every-single-remote-job-lead strategy goes out the window. Instead, search specifically for remote job leads that fall in line with the industry you want to work and uses the skills you know and love. We refer to these as your career ideals. When you cast too wide of a net, you end up spreading yourself a little too thin. I learned this the hard way. I wasted almost an entire year applying to every remote job under the sun without getting a single interview. Instead, of looking like a strong candidate for a handful of jobs, you look like a mediocre hire. Recruiters do not want a mediocre hire. In other words, less is more. Apply to only those work-from-home job leads you actually would enjoy and remember to customize every single resume you send out. After I took a step back, I realized I wouldn’t be happy with just any remote job. I wanted something that used my writing skills, allowed me plenty of autonomy, and made use of my years of administrative experience. As I mentioned before, part of chasing remote jobs requires a firm understanding of what skills you want to use to work from home. Nobody expects you to be a Jack or Jill of all trades. You should, however, have a set of professional skills you’ve honed along the way. These are the skills that will help you get hired at the remote job you want. When I first started looking for work from home jobs, I went after all jobs regardless of required skills. As you already know, this strategy got me nowhere — fast. Once I took a step back and figured out what skills I actually wanted to use in a remote job (for me it was administrative) it became a lot easier to position myself as the ideal hire. Instead of writing my resume to look like I knew a little about a lot, I focused it to highlight my clerical and administrative experience. Doing so suddenly increased my value to prospective employers and helped me stand out as the administrative professional I was. But what if, let’s say, you’re a little rusty? Perhaps it’s been awhile since you’ve held an office job. Maybe you’ve been a stay-at-home parent for the last decade. Maybe the last time you learned something new was when you graduated from high school some 20 years ago. Whether you need a little refresher or a complete remote-friendly skills overhaul, don’t worry. You have plenty of options available to strengthen your skillset. These online courses will teach you a work-from-home skill and help you find work when you’re done. There’s no sense applying to a remote job that doesn’t fit in with your career ideals. As I mentioned before, your career ideals include how you work, where you work, and what you do for work. But, your career ideals can also indicate the type of company you want to work for. So, once you find a remote job you think sounds promising since it includes the industry you like and uses the professional skills you’re actively marketing, it’s time to do a little homework on the company. I ended up wasting a solid two months of my time going back and forth with a hiring manager. The job sounded promising. It was a remote administrative position in the HR department of a well-established company. Honestly, it sounded like a dream! After submitting my keyword optimized resume for consideration, I was called for a phone interview. Woo hoo. I nailed the phone interview and was short listed for the position. For the next two months, I went back and forth with the hiring manager. I provided references. I took several aptitude tests. There were even a couple of “test” projects I was given. At the end of each round, I was told that I was in the running for the position. All I had to do was finish the next task to keep moving on. Well, during this time, I stopped looking for other remote jobs because, after all, I was so close to landing this one, right? Wrong. When everything was said and done, the hiring manager sent a Dear Jane email stating that hiring for the position was put on hold indefinitely due to budget concerns. After I was rejected, I hopped on Glassdoor and did a search of the company. Their ratings were horrible. Several former employees reported being hired and then fired within 90 days for no apparent reason. Many more interviewees, like me, complained of doing free work during the interview process with the promise of a job offer only to be kicked to the curb last minute. Had I taken the 15 minutes to hop on Glassdoor or Google to begin with, I would’ve saved myself a ton of time, energy, and effort. Just as quickly as the company approached me for an interview, I would’ve politely declined after reading about their shady hiring practices. So, learn from my mistake, before you invest your precious time into applying for a job, research the company. You might be surprised at what you find. I’m an introvert. Fortunately, introverts make great remote workers. On the flip side, it meant networking was not my strong suit. But I quickly learned that, in the world of remote job seeking, you can’t land a work-from-home job if no one knows you’re looking for one. At first, I simply relied on resumes to get seen by recruiters. Unfortunately, this isn’t the most effective strategy. You see, reports estimate that between 50% – 80% of job openings are never advertised. Instead, recruiters and hiring managers rely on word of mouth referrals to fill positions. That means, you increase your chances of getting hired when you learn about a job opening from your network. Once I faced this hard truth, I logged into LinkedIn (which I hadn’t used in years) and got started. First things first, I gave my LinkedIn profile a powerful makeover. This included an updated photo, rewritten summary, and a headline that attracted attention. And of course, as all things written online should be, I rewrote every section to be keyword optimized. Remember, when a recruiter or possible new connection searches on LinkedIn, they use a series of keywords related to an industry or position to find a particular person. The more of these keywords you have in your own profile, the better chance you stand of connecting with said searcher. And trust me, it works. Once I got active on LinkedIn and made the effort to make connections, I started receiving invitations to interview for positions I didn’t even know existed. In fact, two of the remote jobs I landed came directly from LinkedIn connections. I didn’t have to search for them. They came to me. Even if you’re introverted or against all things social, you need to be on LinkedIn. Period. Your next connection can lead to your new remote job (and beyond). I don’t need a personal brand. Or, at least, that’s what I used to think. I assumed personal brands were for artists or creators who needed to showcase their talents in order to get work. Personal branding simply wasn’t for an everyday professional, like me, who was looking for a work-from-home job, right? It’s 2018. Every job seeker, especially remote job seekers, need a personal brand. For starters, your personal brand lets you control your own professional narrative. How do you want to be seen by colleagues, recruiters, and throughout your industry? When you take the proactive approach to personal branding, it’s totally up to you. Remember, approximately 80% of recruiters will google potential hires before they invite them to interview. Your social media accounts, LinkedIn profile, and personal website are all building blocks of your personal brand. These are also the links that come up when a recruiter types your name in Google. It’s your job to ensure that all of these profiles and sites are professionally polished, cohesive, and present you in the best light possible. I have a common name. It’s Ashlee Anderson, just as a reminder. There are thousands of other Ashlee Andersons out there in the world. So, as a remote job seeker, I was nearly impossible to find. My Linkedin was buried. Facebook had no mention of me. All my industry-related tweets were nowhere to be found. It’s as if I didn’t exist. And, for remote job seekers, this is a big problem. Remote job seekers do not get a chance to hand in a resume in person. They don’t get to come in to a face-to-face interview and knock the socks off of the recruiter. Instead, their online presence is often their first (and only) impression they have. It needs to count! Once I realized I was getting lost in the sea sea of Ashlee Andersons, I knew I had to position myself as the one and only Ashlee Anderson. I created a personal website. This 5-page site did more for my career than any resume or referral ever could. Now, when recruiters googled me, the first thing that popped up in Google was my very own personal website — a website I had total control over. I filled it with content that highlighted my industry experience and explained my areas of expertise. Plus, it served as a platform for potential connections to, well, connect with me. I had a “Get In Touch” Page that linked directly to my social media profiles that I worked hard to clean up. Now, there was no question that I was Ashlee Anderson, remote work enthusiast and administrative maven. Recruiters didn’t have to guess who I was or whether a social profile belonged to me. I gave them everything they needed in a single website that I controlled. I can’t tell you how many recruiters I connected with via LinkedIn who started off by saying, I found you through your website. Do yourself a favor, start building your personal brand now. And it all starts with your very own DIY personal website. It’s easier than you think! Believe me when I say, it is possible to find (and land) a remote job you’ll love. Remember, remote work is on the rise and shows no signs of slowing. That means there’s plenty of work-from-home jobs to go around. You just need to focus and refine your job search to actually make progress. First, narrow your job search. It’s not about quantity of applications, but quality. Figure out your career ideals and apply only to those jobs that align with them. That way, when you submit an application, you can easily keyword optimize it to get past ATS and in front of a real recruiter. And don’t forget to network and build your personal brand. Positioning yourself as the go-to expert in your industry can go a long way in getting job offers you didn’t even know about. You’ve got this! P.S. This post may contain affiliate links. Check out my disclosure statement to learn more. 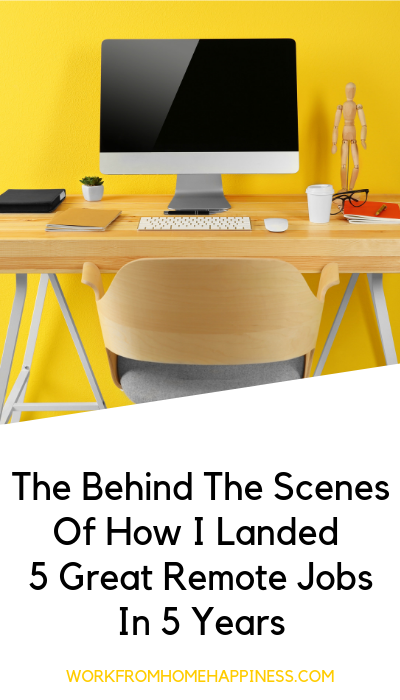 The post The Behind The Scenes Of How I Landed 5 Great Remote Jobs In 5 Years appeared first on Work From Home Happiness.